Untitled (Mud Drawing), 1992 is an early example of Long’s works on paper made from mud sourced from the River Avon in Bristol – a city where the artist was born, brought up and still lives to this day. Longs’ use of this very particular, natural material adds an implicitly personal, autobiographical quality to the work and he has been known to transport this mud with him all over the world to make wall paintings with it in other countries. As Long makes clear here, the notion of making marks with the hands or feet was present from the very beginning of his practice. His works comprising circles, rings, spirals and lines of hand and foot prints made in mud originate from his observation of the prints left by his feet outdoors in the earth. Referring to his work as a whole, Long has commented: ‘Everything is mediated through my body’ and delving into this point deeper, he explains: ‘My work is really a self-portrait, in all ways. So, for example, to walk across a country is both a measure of the country itself (its size, shape and terrain) and also of myself (how long it takes me and not somebody else). In other works, like my hand circles in mud, or waterlines, my work is more obviously an image of my gestures.’ The imprints left by Long in his fingerprint works in particular, reference the artist in a very clear way. 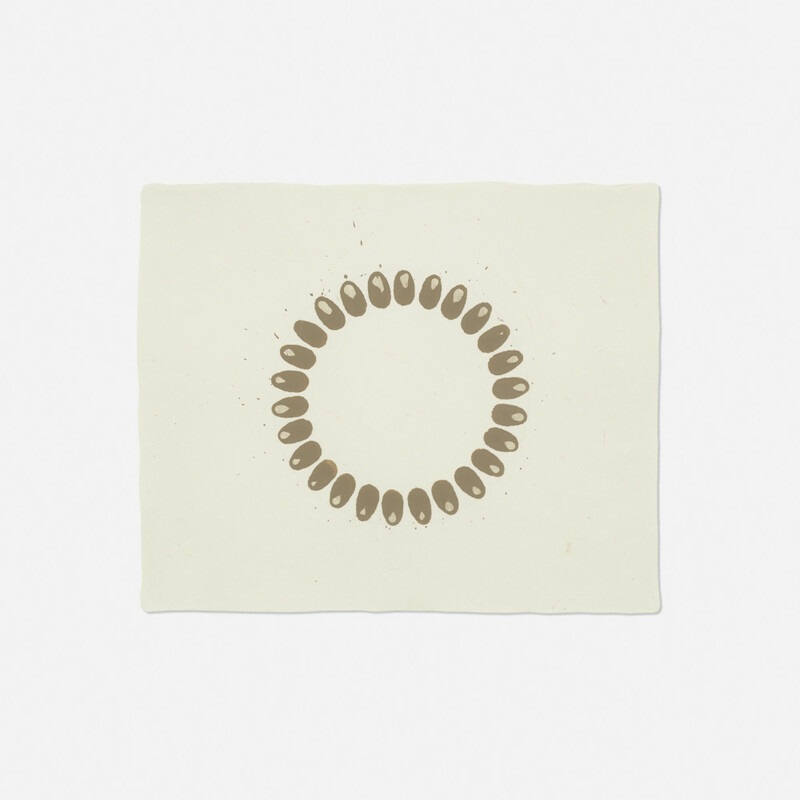 Long’s belief in the emotional power of simple, archetypal, motifs is particularly visible in his fingerprint works. Each, executed spontaneously, has a simple rhythmic logic, reminiscent of tribal patternings and indeed, the artist has acknowledged this reference: ‘I feel there is a spirit in my work which is close to all that, a primitive element, just working with my hands with the natural materials of the earth, like clay or mud or water. Different reasons, different context, but a direct human line from cave paintings.’ Here the prints take on a circular motif, which is emphasized by the rich contrast in materials - the dark, textured, muddy prints against the light-coloured, thick paper result in a striking image.